One party in our province once made a choice. That party decided, against strong voices of fear-mongering critics and those with hidden financial agendas, to free Ontario drivers from the intrusive technology known as photo radar. The opponents forecasted that more people would die on our roads. This never happened and we are literally a “living” proof of their lies. Statistics are clear: Ontario has some of the safest roads in North America and around the world. Our drivers contribute to such amazing success, without fear of photo radar snapping their pictures everywhere they drive, and painful, unnecessary fines that arrived without warning. That party’s name has forever been embedded in Ontario’s legacy. The drivers remember. You are standing in front of another choice once again. A choice to free the drivers from the ever-oppressive, hypocritical and unreasonably low divided freeway speed limit of 100 km/h. A speed limit that is seldom seen elsewhere around the world nor is it respected by Ontario drivers. A speed limit that does not reduce speeds beyond what is globally deemed as safe on similar roads. A speed limit that makes us feel scared the moment we merge onto a highway. A speed limit that robs us in ticket fines, raises our insurance rates and takes away hard-earned money from families. A speed limit based on fear rather that road safety science and engineering. Yet again, the minority of vocal critics will repeat baseless slogans to push you away. Yet again they will paint a picture of bloodshed on the roads. You have an opportunity to be on the right side of history once again. We urge you to stand up against the unfounded and fear-mongering “speed kills” propaganda and side with the people. You will prove the critics wrong like you’ve done before. You will win in the eyes of your people. Your name will forever be embedded in Ontario’s legacy. The drivers will remember each time they drive when they will no longer fear the Police when driving at 120 or 130 km/h on clear, open and safe stretches of road. Just like the drivers in most industrialized countries on Earth. A friend of mine, a nurse who also teaches college and has two teenage children has recently received a speeding citation on a clear, straight, multi-lane stretch of highway 401 near Cobourg. She was charged with going 130 km/h in a 100 km/h zone. Her charge was not reduced in court when she pleaded not guilty. Her punishment included roadside humiliation, a $259 fine, 4 demerit points and an upcoming painful insurance rate hike. All for driving at a safe and reasonable speed millions of us drive every day. And millions more who legally drive at 130 km/h in over 20 jurisdictions around the world (and over 40 more countries/states which post 120 km/h on speed limit signs) - with great safety scores! My friend’s driving would be praised in such respectable countries as France, Denmark or Germany (all of which have extremely safe highways) and would receive a police officer’s “thumb’s up” in Texas. Shame on our great province for punishing safe and prudent drivers and inflicting financial pain on their families for no wrongdoing! It is now your time to act to end this evil and injustice once and for all. It is time for the political 100 km/h speed limit to share the fate of the unwanted photo radar. 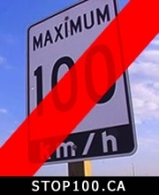 About 72% of drivers say “no” to 100 km/h on speed limit signs according to a newspaper poll. Even more have been misinformed by years of false anti-speed propaganda. Please see www.stop100.ca for details. The facts are clear. * Speed NOT a major cause of fatal collisions - 93% of fatal crashes in 2009 were NOT related to excessive speed or speeding. * Fastest roads = safest roads - 93% of 2009 fatalities occurred outside of the 400-series highways (on city and secondary roads, ie. slower roads). Source: Ministry of Transportation of Ontario.